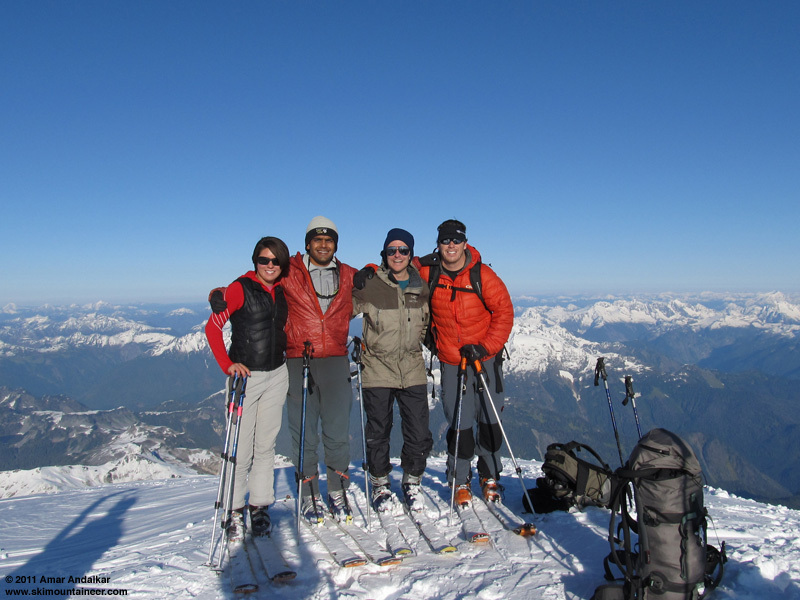 Had the pleasure of skiing with Ben Kaufman (a birthday surprise I coordinated with his wife), Hannah and Amar for a ski ascent/descent of the Coleman-Deming on Saturday.� The Kaufmaniac has this amazing knack for crushing it off the couch, and yesterday was no exception.� Since first skiing Baker in '99, I think this was probably the best weather I've ever experienced on this mountain.� It was also one of the most heart thumping: a near close encounter with a yawner of a crevasse and an icefall-triggered avalanche off of Colfax Peak's upper icefall that literally had us running. 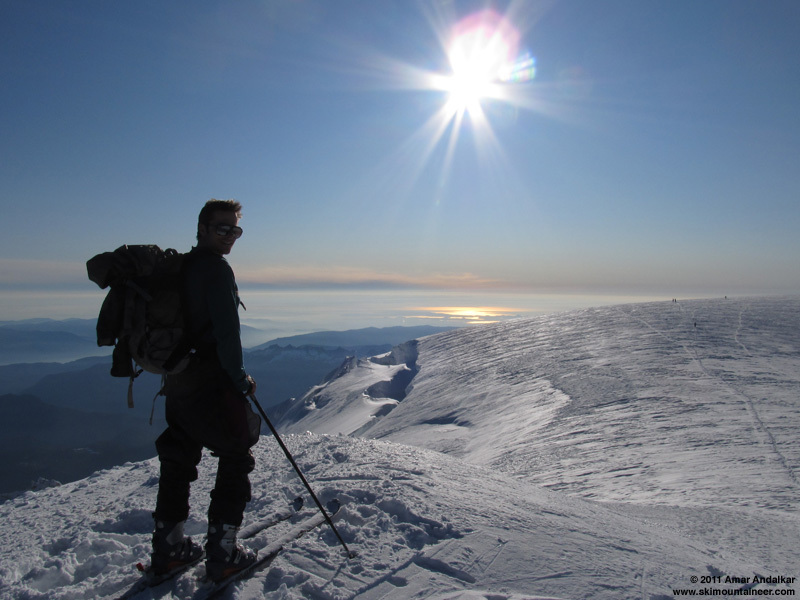 As Amar measured on the summit, a maximum wind gust of 3mph was had, and even that was rare.� The ski descent, for the most part, was amazing.� This past week's weather delivered:� Roman wall skied fantastic as did the upper part of the Deming; however, below the saddle, it became truly hero snow.� Several inches of low-density fresh made for some amazing turns.� The traverse down low toward the typical high-camp area gave us a little breakable crust, but the final descent down the tow of the glacier was amazing. As Ben commented at the end, best birthday present in a decade.� Joyeux Anniversaire! I'm sure I, Amar or Hannah will add pics/additional beta. Excellent conditions yesterday, here are a couple of pictures to add. Nice! What a great birthday present Ben! Nice pics - it looks beautiful up there! I'm jealous! Climbing the ridge above Coleman-Deming saddle near 9300 ft, just after we stopped skinning, with Colfax Peak behind. Ben skins to the summit, with the late afternoon sun reflecting off Puget Sound. 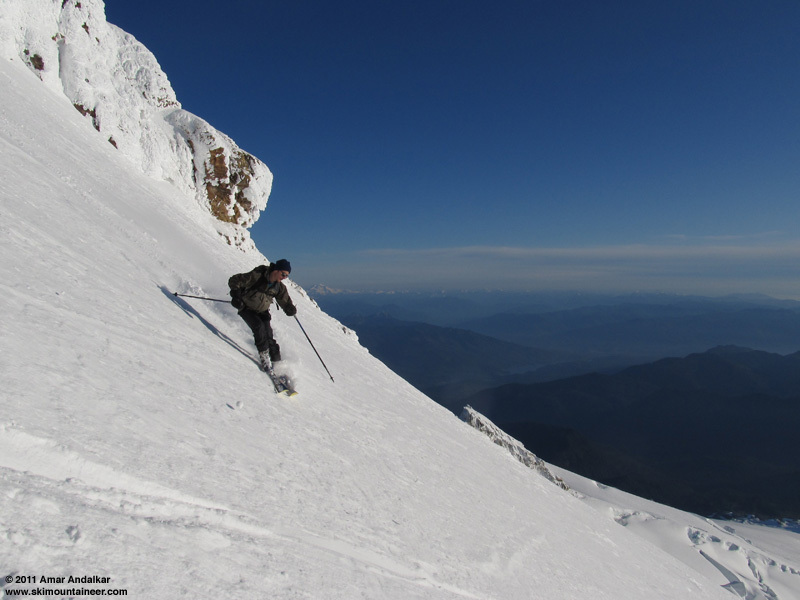 Ben skiing the Roman Wall, with Glacier Peak in the distance. 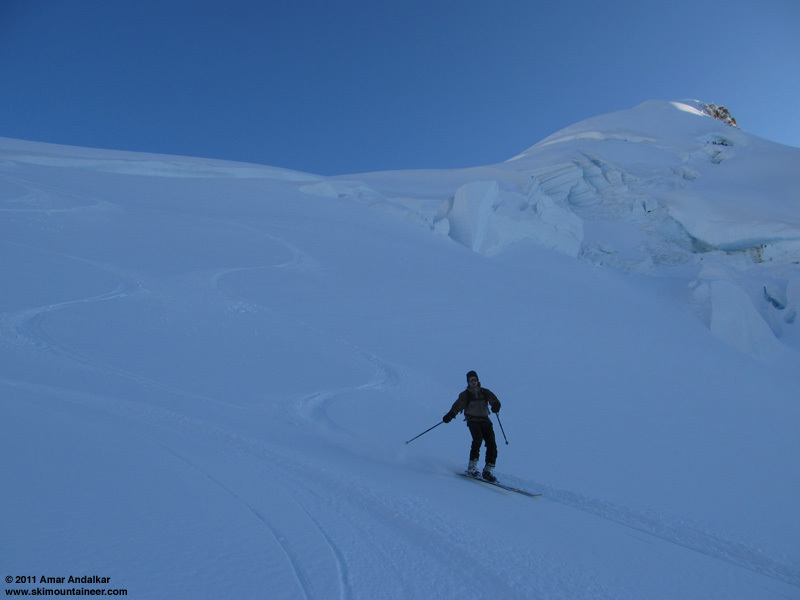 Sweet powder on the Coleman Glacier. Patchy new snow extended down to about 5000 ft along the trail. 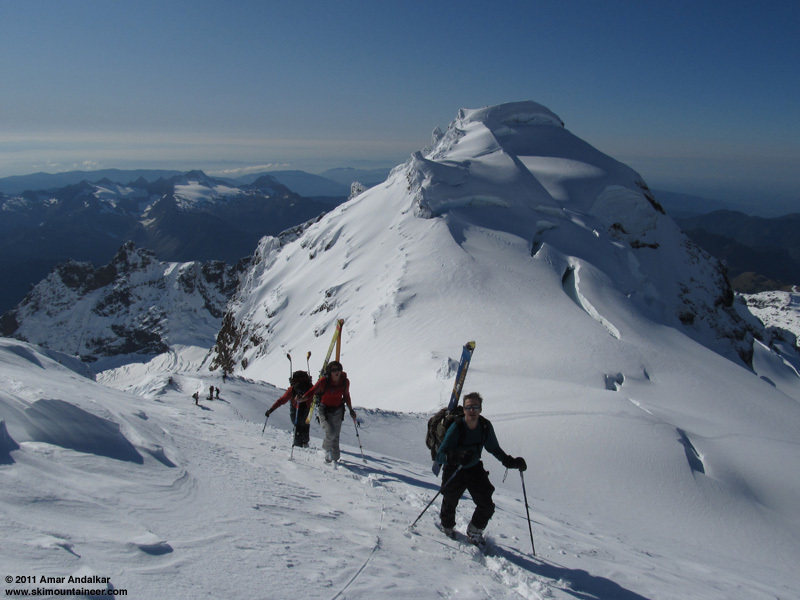 We skinned up from 5700 ft, well below Hogsback Camp, and followed the existing skin track which went right (west) toward the Heliotrope Ridge yo-yo slopes, then turned left (east) to traverse back to the main part of Coleman Glacier near 7000 ft. This avoids skinning up the steep face just above Hogsback Camp. At day's end we were able to carefully ski back to the same point, with about 4-8" of snow on the ground atop a rain crust, but also lots of rocks to avoid. Make sure to stay climber's left (east) above 8000 ft while ascending the Coleman Glacier, don't be tempted into following a skin track which goes up and right, which leads to two unnecessarily sketchy crevasse crossings (the first is on a 40+ degree sidehill with thick rain crust topped by a few inches of snow). The left route has no crevasse problems, and the two sets of tracks rejoin near 8500 ft.
We skinned from 5700 to 9200 ft, booted the ridge above Coleman-Deming saddle and the Roman Wall, and then skinned again from 10600 ft around the south side of the summit dome to the true summit. 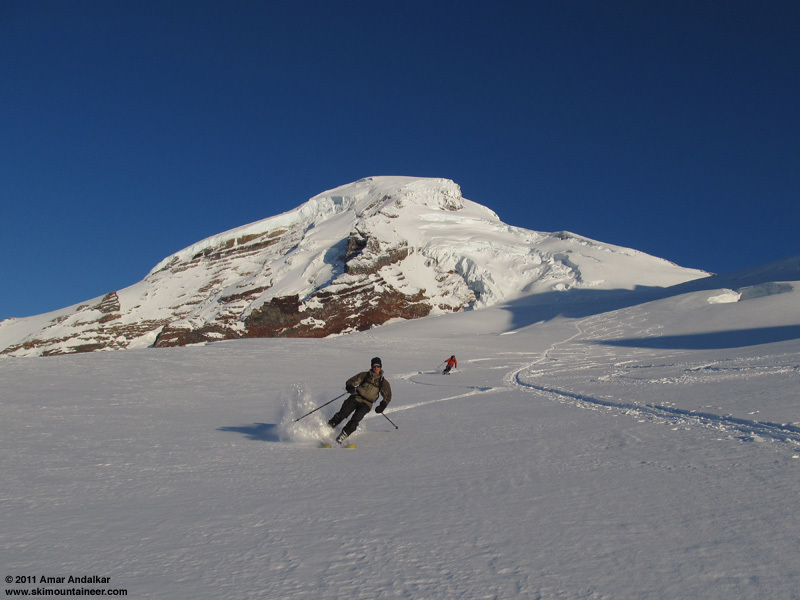 Well after 4pm was still a fine time to summit, and we skied down at 5pm -- Mount Baker is very accommodating of late afternoon ski descents if the weather is nice! And it was about the nicest weather I've ever seen up there in over two dozen Baker summits, 32 �F and calm winds. Just a totally spectacular day, certainly among the better ones I've ever had in the mountains. Way to go team!� Beautiful day up there yesterday too, but Amar's wind speed meter would have read 10fold, it was clear, cold, and windy - like 'lets get outta here NOW windy'. Coleman reports on his Coleman-on-Coleman experience= always excellent. re crevasse & slide, glad you guys had fun and made it out safely. Happy birthday, Ben; I love you way homo. Must have just touched myself in a sensitive place after cutting a habanero for the curry. Thanks for this report....It made me reschedule my life..
Looks and sounds like a great outing! Glad you were unscathed by the 40-degree sidehill event- spooky! nice. were you in the party of three? Thanks for the skin track. We we're a party of two.The team of three, I think was one skier and two snowboarders.